On June 5, 1983 the Philadelphia Stars, the team with the best record in the United States Football League at 11-2, hosted the Michigan Panthers, winners of 7 of their past 8 contests to make them 8-5 after a slow start. The Stars, coached by Jim Mora, had an efficient, ball-control offense spurred by rookie RB Kelvin Bryant and a stingy, opportunistic defense. But as effective as Philadelphia’s offense had been, QB Chuck Fusina (pictured above) was sacked 45 times in 13 games. In addition, the Stars were coming off a tough loss to the Boston Breakers the previous week that had cost them an opportunity to wrap up the Atlantic Division title. Meanwhile, Head Coach Jim Stanley’s Panthers had unheralded rookie QB Bobby Hebert and the better-known first-year WR Anthony Carter featured in an exciting offense while the defense, led by LB John Corker, was the best at sacking opposing passers. There were 19,088 fans in attendance at Veterans Stadium. The Stars were up by 9-0 after a quarter of play following a 38-yard field goal by David Trout and a 15-yard touchdown run by Bryant, although the extra point attempt failed. However, the Panthers took control in the second quarter, holding the ball for all but two minutes. Bobby Hebert passed to TE Mike Cobb for a five-yard touchdown six minutes into the period, followed by Novo Bojovic’s successful PAT. Hebert then put the Panthers ahead with a one-yard run around end just before the end of the half. With the extra point, it was 14-9 at the halfway point. The Stars came back to take the lead two minutes into the third quarter when Fusina connected with FB Booker Russell for a 39-yard touchdown and the successful extra point made it 15-14. 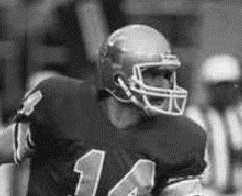 Later in the same period, Fusina struck again with a five-yard TD pass to WR Scott Fitzkee. The Panthers responded with a big play as Hebert completed a bomb to RB John Williams, who charged past LB Jon Brooks for a 53-yard touchdown, but the try for two points that would have tied the score was unsuccessful. Philadelphia put the game away with just under two minutes remaining to play on a five-yard scoring pass from Fusina to RB David Riley. The Stars held on to win by a final score of 29-20. The Panthers had the edge in total yards (398 to 328) and first downs (25 to 18). Each team turned the ball over once. Michigan was only able to sack Fusina twice, thanks to his utilizing a quick drop to thwart the blitz. Novo Bojovic also missed both of his field goal attempts, with one of them a close call. Chuck Fusina completed 24 of 32 passes for 227 yards and three touchdowns with none intercepted. Kelvin Bryant ran the ball 15 times for 74 yards and a TD and caught 5 passes for another 62 yards. WR Willie Collier had 6 pass receptions for 47 yards. For the Panthers, Bobby Hebert was successful on 25 of 45 throws for 314 yards and two TDs and had one picked off. Anthony Carter caught 6 of those passes for 74 yards while RB Cleo Miller also had 6 receptions, for 49 yards. Mike Cobb contributed 5 catches for 56 yards and a touchdown and, thanks to the long scoring reception, John Williams gained 65 yards on his two receptions. RB Ken Lacy led the ground attack with 71 yards on 13 attempts. “I have to give them (the Stars) credit because they made the big plays at the right time,” said Coach Jim Stanley in defeat. The Stars went on to finish up with a 15-3 record and won a dramatic come-from-behind overtime victory over the Chicago Blitz in their Semifinal playoff game. However, it was the Panthers who triumphed in the end, topping the Central Division at 12-6, handily defeating the Oakland Invaders in the Semifinal round and then edging Philadelphia in the rematch for the USFL Championship by a 24-22 score.